DD Form 106 - also known as the "Dod Issuances Program Coordination Initiation" - is a Military form issued and used by the United States Department of Defense. The form - often incorrectly referred to as the DA form 106 - was last revised on April 1, 2018. 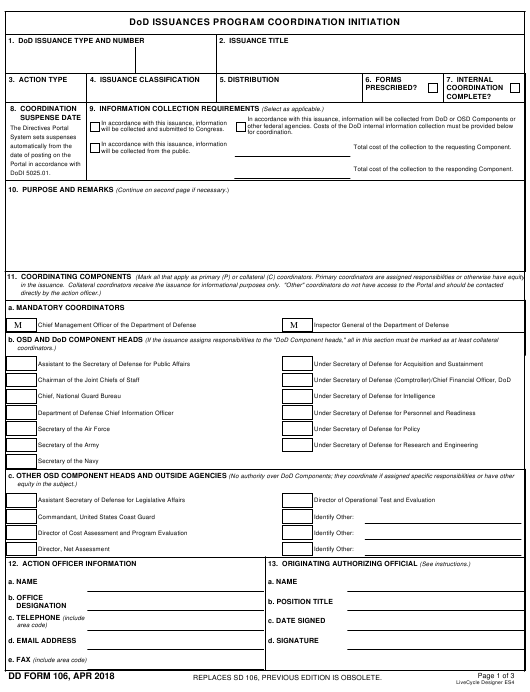 Download an up-to-date fillable DD Form 106 down below in PDF-format or find it on the Department of Defense documentation website. will be collected and submitted to Congress. Total cost of the collection to the requesting Component. will be collected from the public. Total cost of the collection to the responding Component. REPLACES SD 106, PREVIOUS EDITION IS OBSOLETE. ITEM 2. TITLE. As stated. (No longer than two lines). ITEM 3. ACTION TYPE. As stated. ITEM 4. ISSUANCE CLASSIFICATION. As stated. Components who are provided the issuance for informational purposes only. Public Release” for issuances that must not be released on the Internet. ITEM 12. ACTION OFFICER INFORMATION. As stated. determine how the issuance should be released and distributed. 7750.07-M for guidance on DoD forms. ITEM 8. COORDINATION SUSPENSE DATE. As stated. of Signature Authorities Approved for DoD Issuance Actions.